The largely rural suburban parish of Wyke was centred on the church of St Mary, but after the railway reached Chichester in the 1840s and actually traversed the parish, the adjacent area was built up and a new church was built as a chapelry. This has now become the parish church, following the redundancy of St Mary in 1994. 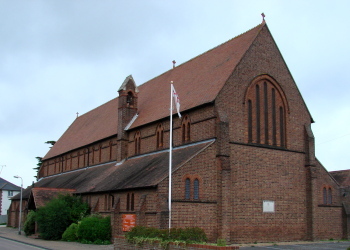 St George’s was designed in 1901 by J E K and J P Cutts (B 81 p322) and completed in 1902; it was costed at £5,500. This was raised against the opposition of more prosperous members of the parish, who were content with St Mary’s. The material is brick, inside and out, with combinations of lancets, including five high up at the east end and pairs with roundels to the west. There is no sign that a tower was intended, just a small brick belfry to the south where nave and chancel join. The chancel clerestory windows change from single lancets to pairs with a circle over. The equally sober interior is well proportioned. Only the piers of the arcade are stone; even the moulded arches, narrower in the chancel, are brick, though the spandrels are painted white. The only elaboration is the arches at each end enclosing the east and west lancets. 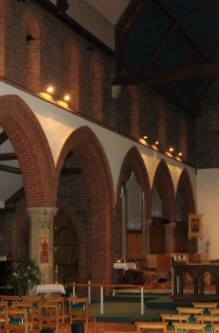 There is no chancel arch, only a rood-beam dividing the chancel and nave. The figures from this are mounted on the east wall. 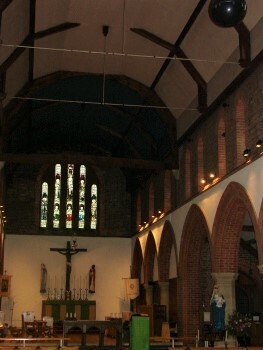 The roof is canted throughout and in the chancel has been painted blue. On the south side a small Lady Chapel continues the line of the aisle. The lean-to west porch was dedicated in 1913 (CDG 238 (1913) p189). An extension on the north side dates from 2002. Font: Round and looks contemporary with the church. 1. The architects designed the variegated patterns of the plain glazing (BAL MSS DB/10/3). 2. (South chapel centre) Four lights by Heaton, Butler and Bayne, 1934) (CDG Jan 1935). 3. (South chapel – east and south west windows) C J Edwards, 1960 and 1968. The earlier window glows with intense colours, contrasting with the muted tones of the later one (www.stainedglassrecords.org retrieved on 11/2/2013). 4. (South aisle) Three single lights by Kempe and Co, 1914, removed here from the redundant church of All Saints, Portfield. Roodscreen: Dedicated in 1913, but now gone. The figures behind the altar may well be from it.